I gave up on fountain pens years ago when I no longer handwrote enough to make the maintenance worthwhile, but this review tempted me a little anyway. I've used them intermittently for years, but primarily the very cheap ones, and modern ones tend not to need a huge amount of maintenance if you're using them at least semi-regularly. But last year I fell down the rabbit hole when I decided to see if I could replace my Parker Vector calligraphy set and Amazon's Mighty Algorithm took that as the cue to wave cheap Chinese fountain pens at me. They do have a serious use for me, because my RSI means that a pen that doesn't need any pressure is a lot more comfortable to use, and a fountain pen with a reasonable nib fits the bill. I hadn't done much writing at home for a long time, but then I got chronic migrraine and staying away from the computer was a really good idea, so composing first and transcribing later was useful. I had a thing for ink reservoir pens, and went from ~daily journaling to not at all and would go to write a letter and find a sticky mess. (It having been three to six months.) And there are darn few handwritten letters nowadays. I still have a weakness for fancy titanium body pens that take a broad range of refills, in my case nigh-always Fisher space pens. I tell myself that this is so I have a robust writing implement for birding, but there's a lot of shiny involved. 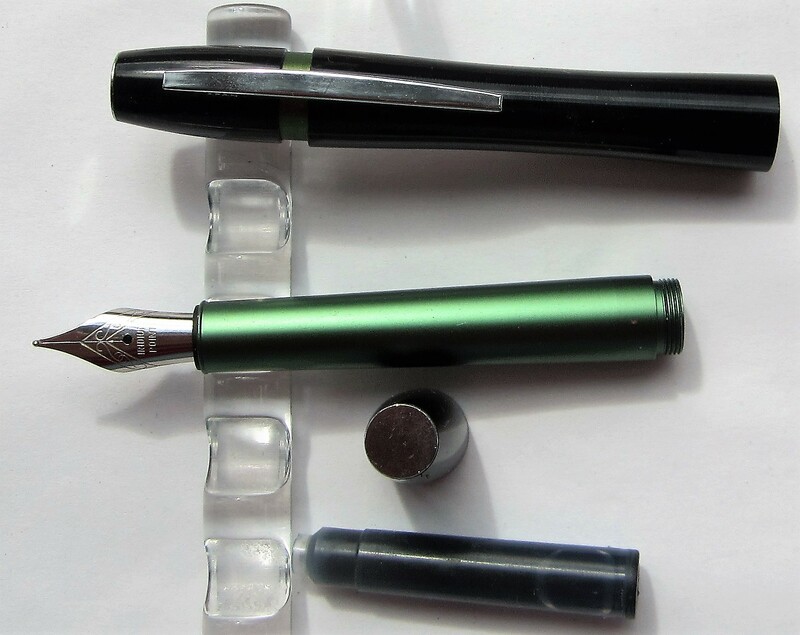 My go-to fountain pen for many years was various iterations of the Parker Vector with cartridges and converter, and I still much prefer a cartridge/converter fitting; and a clear piston converter, not an aerometric or other squeeze bulb converter. They are much easier maintenance-wise. I was Not Happy when I bought a very cheap Chinese knockoff of a Parker 51 to find a fixed sac as the filling mechanism - lovely nib considering it cost a pound including shipping on the slow boat from China, but as I discovered very annoying to look after. It was much easier to resist the Tasche pocket pencil, because I can't remember the last time I would have actually needed one. I would have *loved* one when I worked in a lab, though. That website is nearly as dangerous as www.jetpens.com! My comment on Twitter when posting pictures of the latest delivery was that it's the stationery equivalent of TV Tropes. I've got one that I use reasonably regularly. I tend to use it for taking notes at festival committee meetings. It looks mighty fine. I have to confess that, being a left-hander, I was relieved when I reached the point in school when fountain pens became no longer obligatory and I was able to switch to ballpoints exclusively. If only we wrote from right to left I'd have had no problem. A special left-hander's nib partially counteracted my tendency to dig the point into the paper as I pushed it across the page. But it didn't help with the contortions of my hand needed so as not to blot what I had just written. Yes, they're tricky to use left-handed because of the blotting problem. I'm not that strongly right handed and occasionally write left handed just to see if I can - and ballpoints are definitely better. Seems to depend on what way you were taught (or stumbled into) to hold the pen, and also the paper. Gel pens must have been a wonder and a joy for left handers when they first came on the market. I am Weird because I've been known to not notice that I've picked up the nearest pen with my left hand while staring down a microscope - and produce mirror writing. It was much too untidy so I put my point counter on the left to have my right hand free for writing, which tended to freak the other microscopists, including the left-handed ones. Perhaps I'm stuck in the past, but I confess I don't know what a gel-pen is. I've never been aware of any difficulty using a ball-point, but it might help to explain why my handwriting is atrocious. Nowadays I write very little by hand, other than my signature and names and addresses on envelopes (which I print in block capitals to ensure they are legible). It probably didn't help my handwriting that, having initially been taught copperplate at the age of eight or so, when I started grammar school at age eleven they decided that my class's handwriting was atrocious and taught us all italic, so that now my writing is a confused mish-mash of the two. Fountain pens use liquid ink. Ball points use printer's ink, which is naturally viscous goo and gets sheer-thinned by the ball to be transferred to the paper. It is generally also (unlike the liquid ink) not water-based. Gel pens are mechanically like ball points but they're using ink that's pigment particles suspended in a water-based gel which is even more viscous than regular ballpoint ink. The result is more opaque colour that shows better on a wider range of surfaces and a larger range of ink features. (E.g., glitter pens.) Many people don't care about all that and are much happier with the quality of the writing experience; all the convenience of a ball-point and (very nearly) the low-pressure gliding writing experience of a fountain pen.